Columbia University has opened 2018 prize nominations for judicial services and legal decisions supporting freedom of expression. What is a bit special about these awards is that they go to ‘court rulings” and “legal services” in the area of freedom of expression. 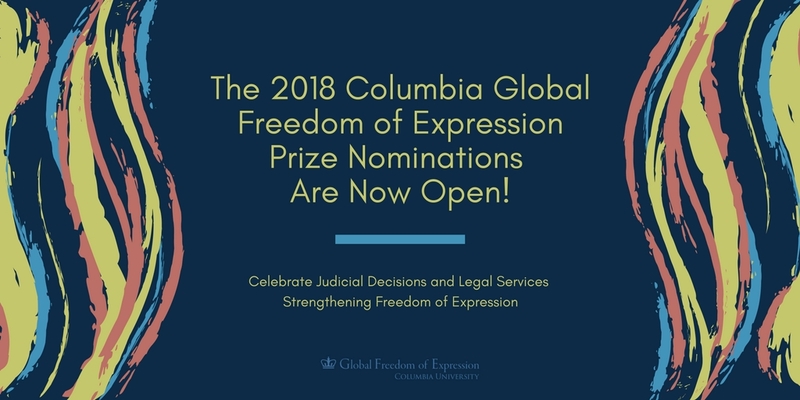 The Global Freedom of Expression initiative at Columbia University in New York City has opened nominations for its 2018 global prizes, which recognize judicial decisions and legal services strengthening freedom of expression through the promotion of international standards. The initiative “seeks to advance understanding of the international and national norms and institutions that best protect the free flow of information and expression in an inter-connected global community with major common challenges to address.” It awards the Global Freedom of Expression Prizes, which began in 2014, every two years. “We believe that at a time when freedom of expression is threatened at a global level, there is a particular need to celebrate the victories in defense of this fundamental right”. Individuals and organizations, particularly jurists, academics and non-governmental organizations dedicated to freedom of expression, are invited to nominate court decisions or legal services from anywhere around the globe that “have had a recognizable impact on freedom of expression.” There will be separate prizes for “Court decision” and “Legal Service.” In the Legal Service Category, the awards will consider legal briefs, amicus briefs, academic or other publications. Nominations will close Jan. 31, 2018 and winners will be announced March 13. Forms are available in both English and Spanish. Members of the Awards Committee are: Lee C. Bollinger, President of Columbia University; Catalina Botero, former Special Rapporteur for Freedom of Expression of the Inter American Commission on Human Rights of the Organization of American States; Nicolas Bratza, former President of the European Court of Human Rights; Lydia Cacho, journalist, human rights defender and author; Agnes Callamard, Director of the Columbia Global Freedom of Expression initiative; Sarah Cleveland, Louis Henkin Professor of Human and Constitutional Rights and member of the UN Human Rights Committee; and Irene Khan, Director-General of the International Development Law Organization. The winners of the 2016 prize for Excellence in Legal Services were Professor Yaman Akdeniz, Assistant Professor Kerem Altiparmak and Attorney at Law Serkan Cengiz for fighting a court order blocking access to YouTube in Turkey. That same year, the prize for a Significant Legal Ruling was awarded for Supreme Court of Norway, Rolfsen and Association of Norwegian Editors v. the Norwegian Prosecution Authority. The court backed broad protection against journalists being forced to expose their sources. This entry was posted on	October 24, 2017 at 13:01	and is filed under awards, human rights.